If you're looking for vegetarian/vegan fine dining, Dandelion & Burdock is where it's at. Dark wooden floors, white linen napkins, stylish decor and great service coupled with beautifully presented exciting dishes that even a stubborn omnivore would struggle to decline makes this restaurant a special, yet affordable, treat. It's situated on a little cobbled alley just off the main road through Sowerby Bridge, and the back windows overlook the convergence of the Ryburn and Calder rivers - so be sure to ask for a table at the back. The confusing title of "pure vegetarian" actually means that everything - literally - is in fact vegan, from the sour cream to the Chardonnay. Result! 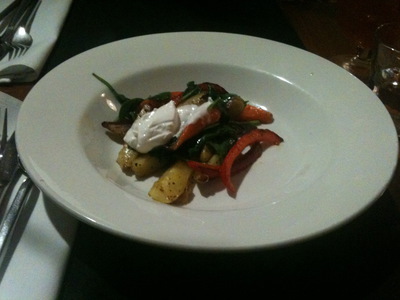 We started with the winter potatoes, a medley of mixed winter vegetables, roasted to perfection, served with a delicious dollop of cold sour cream. The main course of cauliflower cheese tart has made it into my top twenty favourite foods ever - sorry, I'd wolfed it down before I remembered to take a photo. For dessert we shared the orange and apricot cake and fought over the incredible chocolate whiskey pate served with little shortbread biscuits and ice cream. It's good value for money but none-the-less they offer cheaper deals for Wednesday and Sunday dining. They don't yet accept credit/debit cards so remember to take cash. It is nice to see a restaurant that does nothing but vegan/vegetarian. Most places do vegetarian meals, but are not exclusive that. Their menu sounds really nice.